You are here: Home » quick and easy » Craft Lightning Valentine’s Day ALL WEEK! 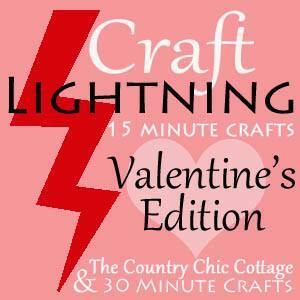 Craft Lightning Valentine’s Day ALL WEEK! It is time for another edition of Craft Lightning. This time we are celebrating Valentine’s Day all week this week. Each morning myself and 30 Minute Crafts will post a craft that takes 15 minutes or less to complete (excluding dry time). Then each afternoon we will post a round up of quick and easy Valentine’s Day crafts from our blog partners. Want a chance to be featured? Be sure to scroll on down and link up your crafts! Do you have Valentine’s Day crafts that take 15 minutes or less to complete? (Don’t count any dry time y’all.) Link them up below then come back here each day next week to see if you are featured. It is that simple. Now link em up and get ready for some quick and easy crafting fun all week. If you have missed any of the features this week be sure to catch up with posts from day 1/2, day 3, and day 4.